Classical Connections: What the......???? Tchaikovsky? I was in the car recently, driving home from somewhere, and I turned on satellite radio, Sirius channel 76....the Symphony channel. I intentionally try not to look at the digital readout that shows what piece is playing because I enjoy trying to guess what it is. I'm not sure what my batting average is, but I'm pretty sure is fairly high. But on this evening, the piece playing was not familiar. I was able to identify it as a string quartet....this was obvious, and it was certainly not a Baroque or Classical period work. It sounded like it might have been from the early 20th century.....it was very a fascinating..and it was captivating. The more I listened, the more perplexed I was......I had no idea what it was or who it was written by. Finally, my curiosity got the best of me and I looked at the display. 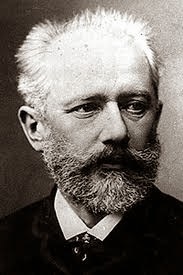 Tchaikovsky.....his string quartet number 3. "This isn't Tchaikovsky" I uttered......."no way". The same composer who wrote the Nutcracker...Swan Lake....1812 Overture? Nope....the music I was hearing sounded nothing like Tchaikovsky. I do confess that I am not a musical historian, scholar, nor expert. As much as I do know about the classical music repertoire, there is far more that I know little to nothing about. Prior to this evening in the car, I had no idea that Tchaikovsky had even written any string quartets. I had tuned in just as the third movement had begun. It has such an unusual tonal quality. Melodically speaking, it is very bare and sparse......nothing to hint or suggest that a master of melody had written it. But it was so powerful. I almost had to pull the car over because I was so transfixed by what I was hearing for the first time. I arrived home as the fourth movement was beginning, but I stayed in the car to listen to it before I went in the house. I could not wait to explore this piece in its entirety the next day....and to read about Tchaikovsky's string quartets. These moments of exploration are wonderful. It turns out this amazing quartet was written in 1876. You can hear the third movement of his third string quartet here.